The equity markets have continued to defy gravity and the fate that many traders believe that market fundamentals could have triggered. We are of the opinion that the rally could be facing a rather large correction but believe that the bears won't "have their day" until early next year. In the near-term, we are facing a statistically positive option expiration week and the infamous Santa Claus rally. During the December Triple witching week, the Dow has been up 22 of last 24. December is the second best month of the year for the S&P and the Dow in terms of percentage gains since 1950; it has been the third best for the NASDAQ. Much of gains posted in December occur in the sessions immediately following the holiday. The market has yielded an average 1.4% in the last five days of the year and the first two sessions in January since 1969. However, according to the Stock Trader's Almanac..."Santa's failure to show tends to precede bear markets". 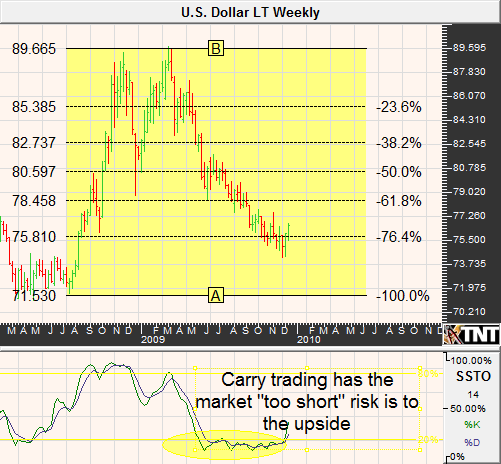 Along with statistics backing the rally, we believe that light volume has the potential to exaggerate a short squeeze. The persistent bears have suffered greatly this year and as the holidays approach they might be making their way to the sidelines (cover their shorts) in hopes of a fresh start in 2010. If you recall last year, even in the midst of one of the largest bear markets in history...the equity markets forged a miraculous rally throughout much of December. Believe it or not, our analysis and conclusion isn't too much different from the previous newsletter. Aside from the Dubai scare during the Thanksgiving holiday, the markets have made little progress in either direction. In fact, we have seen a range of less than 40 points. Going forward, we feel as though the underlying momentum is pointing toward a move that could eventually see the 1150 area in the S&P futures at some point in the coming weeks and maybe even into the 1160's. In the meantime, look for support near 1080/1076. The same rally could bring the NASDAQ to the mid-1800's before running out of steam. However, should these prices be seen they are believed to be great opportunities to be a bear. The Fed has made it obvious that as long as inflation doesn't begin showing up in the data, they will keep interest rates low for a considerable amount of time. According to the FOMC, the economic recovery isn't capable of absorbing higher rates and unless there are compelling reasons otherwise, it is in our best interest (no pun intended) to keep the money flowing as freely as possible. Accordingly, short-term interest rates have kept back to their 2008 lows. I think that we can all agree that the fundamental climate at the end of 2009 is a vast improvement over the frozen credit markets and potential collapse of the financial system experienced in 2008. Yet, investors are once again willing to loan Uncle Sam funds without expectations of a return (a recent T-Bill auction yielded a goose egg rate). We doubt that the short-end of the curve will make any dramatic moves in either direction, but it seems as though the long-bond and the T-note have plenty of room to move on the upside as they attempt to "catch up" with the shorter maturities. Additionally, seasonal strength during this time of year leads us to prefer an approach that involves being bullish on dips. A quick look at the technical aspect of bonds and notes also suggests that traders might be better off on the long side of Treasuries. In last month's newsletter, we were calling for an upside target of 123 and thanks to Dubai World's debt restructuring issue we saw it in late November. Similarly, we noted resistance in the 10-year note near 120. In the meantime, bonds and notes have sold off significantly but appear to be setting up for what could be another retest of the highs. Therefore, we can't help but feel as though trading the range is the way to go. 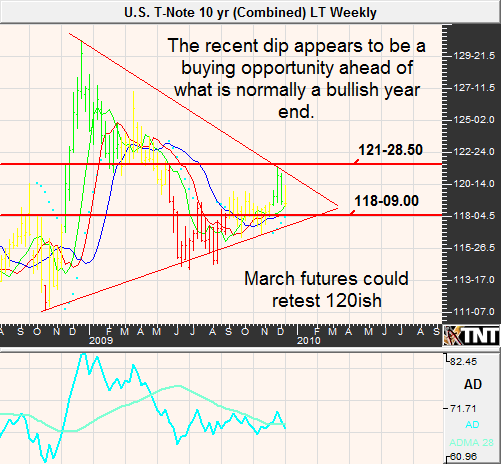 Look for support in the March 30-year near 117, and some risk of a slide to 116'08, but we are looking higher overall. Support in the note lies at 117'08 then again near 116'10. Don't forget, Treasuries can rally with stocks but in such circumstances the price incline in interest rate products is often at a slower pace. Grain traders have little fundamental guidance during this time of year; the harvest has passed and planting has not yet occurred. This leaves traders focused on issues such as the value of the dollar, the global economic recovery, and the corresponding demand. 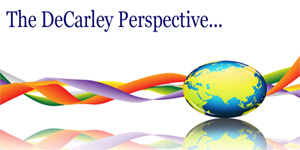 Commodity traders have adopted the premise that a higher equity market is a gauge of the global recovery. Assuming that this relationship continues, our expectations for a short-term rally in stocks should help support commodities. Unfortunately for the bulls, the U.S. currency might eventually be counterproductive to the rally. Accordingly, we feel like any gains in this complex will be moderate at best despite seasonal tendencies for higher prices. Cold and wet harvest weather triggered a sharp rally in late September and throughout much of October. Although, prices haven't made progress since peaking in mid-October it seems as though the bulls have an edge given seasonal strength. On December 10, 2009, the USDA increased its estimates of ending stocks in the U.S from 1.625 billion bushels to 1.675. However, global the stocks are predicted to fall considerably to about 15% of annual use. The news sparked some buying interest and might have been what the market needed to penetrate resistance in the March contract near $4.20. Last month, we mentioned that bulls should wait for opportunities near $3.75ish in March corn and this turned out to be a good idea. This time around, we feel that a break of $4.20 could lead to several gaps being filled with the first being near $4.31 then the next in the mid-$4.50's. Beans have been violently trading sideways since may of 2009 but traders have found little reason to bid prices above the $11.00 area or offer it much below $9.00. Although $9.00 beans used to be considered expensive, in today's market it has become a bargain. The USDA reduced its estimates of U.S. ending stocks for the 2009/2010 year from 270 million bushels to 255. These figures are much more comfortable than the 2008/2009 numbers that resulted in "beans in the teens". The overall stocks to use ratio is estimated to be 8% this year which is a bit skimpy but much better than last year's 5%. Soybeans have enjoyed relatively strong fundamentals, namely steady export demand, and will now be helped by seasonal tendency. For these reasons, we like the idea of converting to a bullish stance on dips. 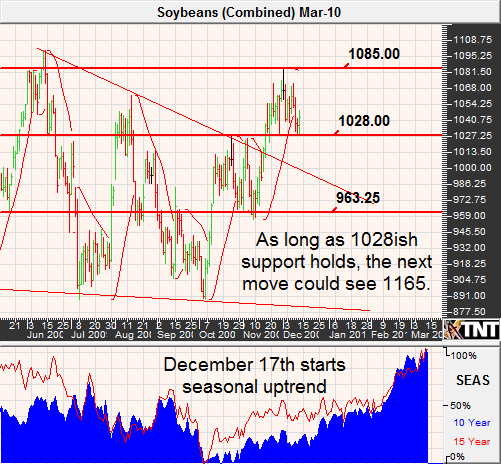 Looking at March soybeans, it doesn't seem like the bears will be able to break the $10.00/$10.10 area. Should these prices be seen again, it could be an opportunity to be a bull. However, near-term support lies near $10.28 and aggressive traders might want to start "nibbling" there. Wheat prices finally found a bottom in late September following several months of decline. 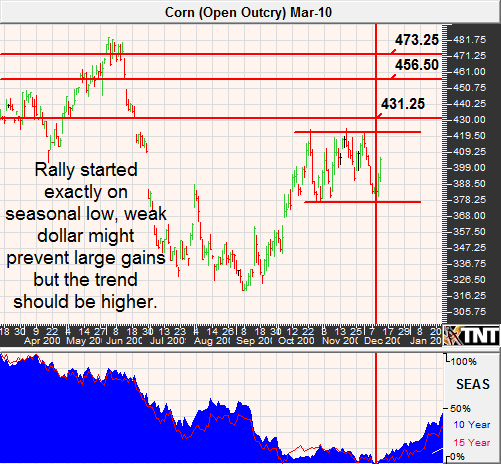 The initial rally was triggered by short covering and moved in sympathy with corn and soybeans; however, going forward there might be enough seasonal support to keep prices moving higher in the near term. A recent revision in the USDA's ending stocks estimates suggests that the supply of wheat is a bit better than most had expected. However, the government analysis also thinks that exports for the current season will be down 14% relative to last year. Currently, demand is down about 31%, leaving some room for improvement going forward. 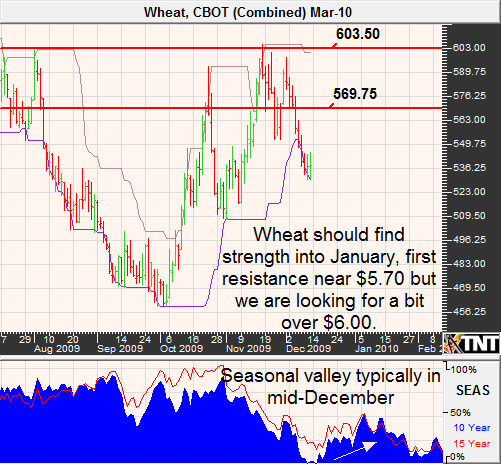 In the previous newsletter, we mentioned that we were inclined to recommend bearish strategies in March wheat should we see above $5.80. We now know that the rally temporarily saw $6.00+ but then turned on a dime. Given the size of the slide, it seems as though current pricing is attractive. We are looking for a potential bounce to the $5.70 area in the March contract, success at breaking resistance there could mean a retest of the highs. Crude oil has been more vulnerable to gains in the dollar than many of the other commodity markets and we expect this negative correlation to continue in the longer-term. With the suffering global economy along with government and consumer initiative to reduce per capita usage, surplus capacity has grown to much more comfortable levels than were seen in 2007/2008. According to the U.S. Energy Department, surplus capacity was 4.1 million barrels per day in October up from about 1.5 million last year. In addition, crude oil stocks were up 4% from a year ago as of December 4th. According to the "Commodity Trader's Almanac" the seasonal short crude trade ended on December 9th. However, looking at recent action is seems as though the end of the move might have come a little late this year. Going forward, historical tendencies are pointing higher in the near-term. Due to fundamentals, we feel as though any rally will be capped; nonetheless, the market is a bit oversold and should see some type of bounce. 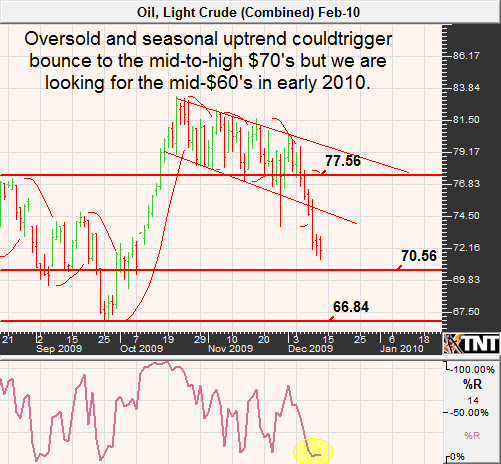 Without a plunge in the dollar, we wouldn't expect February crude futures to exceed the mid-to-high $77/78 range. The infamous NYU professor, Nouriel Roubini, said it best "If you want protection against inflation risk stock up on Spam that you can at least eat, rather than Gold that has no intrinsic value or use." Gold has been touted as an inflation hedge, but let's face it...there are better alternatives. Traders parking money in gold in recent weeks out of fear of inflation have likely suffered dramatic losses or at least mental anguish all the while inflation hasn't budged. The recent rally was built partly on the premise that government policy was promoting price pressures that would eventually come to pass. This might be true, but in the meantime, fortunes made and lost aren't an inflation hedge they are pure speculation plays. As the new-comers (or maybe they should be called late-comers) come to this realization, there might be more liquidation ahead. Even the bulls have to admit that the gold bus was full and needed to lighten up. Accordingly, the recent $100 correction wasn't necessarily a surprise. What did catch us off-guard, however, was the height at which the buying finally ran dry. Last month we stated that a pullback to $1,029 was possible in December. While the market is moving in the right direction, it seems as though we were underestimating the strength of the rally. We still favor the bear camp overall but see support near $1,100 that could spark a temporary recovery. That said, we think that gains will be short lived and gains should be capped in the $1,150 area if they occur. 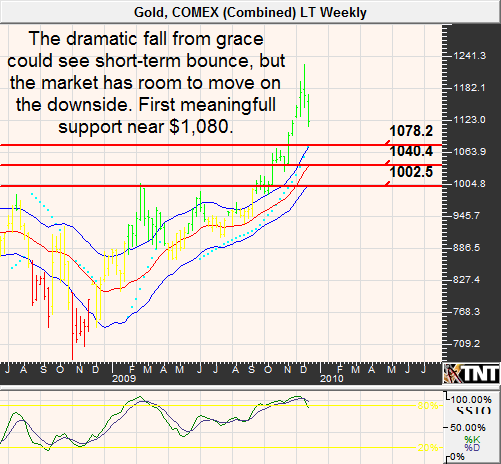 Following a potential technical bounce, we see $1,080 as the first downside objective. The dollar has managed to recover most of the November losses but we wonder if the momentum will be able to last into year-end. We remain fundamentally bullish the dollar and believe that in the overall scheme of things the short covering has only begun. However; we cannot ignore the strong seasonal tendency for the Euro to rally into December 28ish. In other words, despite the progress made we might not see a substantial correction in the currencies until early 2010. 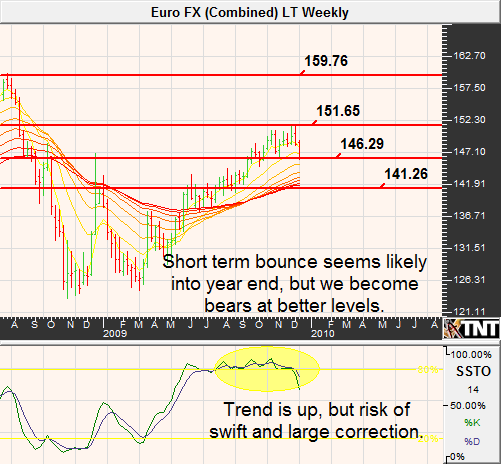 In a nutshell, we like the idea of waiting for better levels to be bullish the dollar and bearish the Euro. The infamous carry trade in which currency traders are borrowing the greenback and buying alternative currencies in order to net the difference in yield (Dollar low, others higher) has been a large contributing factor to the decline of the U.S. currency. Nevertheless, similar action was seen in the Japanese yen a few years ago and when the carry trade was unwound the yen screamed higher leaving destruction in its path. We expect that at some point, not immediately but in the New Year, a similar scenario will take place in the dollar. Look for a decline in the U.S. dollar to the 75.60 area in the coming sessions but we wouldn't be surprised to see a retest of the mid-to-low 74's. If these prices are seen, we would be considerably bullish. Naturally, a decline in the greenback will mean a rally in the Euro. We foresee a bounce in the March Euro to 1.4900 and possibly even a retest of the highs just over 1.5100 but don't get too bullish...we don't think that the rally will last. According to our statistical sources, going short the Swiss Franc (highly correlated to the Euro) on or about December 28th and holding until February 2nd has worked 25 of the last 33 years. This is a success rate of 75.8% and a cumulative profit of $41,350. Of course, these stats don't mention the drawdown experienced while the trade was open, and might have been quite large. Even so, you can see that more often than not this has been the market's tendency. In the previous newsletter, we were calling for a move to the mid-151's but noted that the Euro rally should be coming to an end. This turned out to be relatively accurate but this time we are taking the other end of the rope. We see support at current levels but can't rule out a probe to just under 1.45 before turning around. After what was an exciting summer for sugar traders, the market has essentially flat-lined throughout the fall. This is despite the USDA's prediction that world sugar stocks at the end of 2009/2010 are expected to be down 1.6 million tons to 26.0 or 17% of annual use. It is apparent that the market had already priced in the lowest stocks to use ration since the early 1990's and it will take something even more surprising to get things moving higher from such lofty levels. March sugar has found comfort trading between 22 and 25 cents and seems to be in the process of testing resistance. 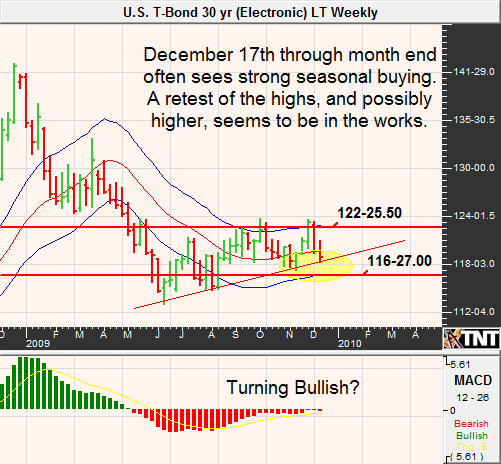 Seasonals remain bullish and the sideways trade suggests that the bulls still have a case. The market's ability to break 24.38 will the be the test but we see decent prospects for a breakout to the upside. Unfortunately, so does the market...calls are considerably overpriced relative to puts. If you want to play this market you are better off using long futures and maybe even buying puts for insurance. However, we never recommend chasing prices higher so waiting for a pullback would likely be wise. 22.75 is first support but closer to 22 could turn out to be a great buy if those prices are seen again. 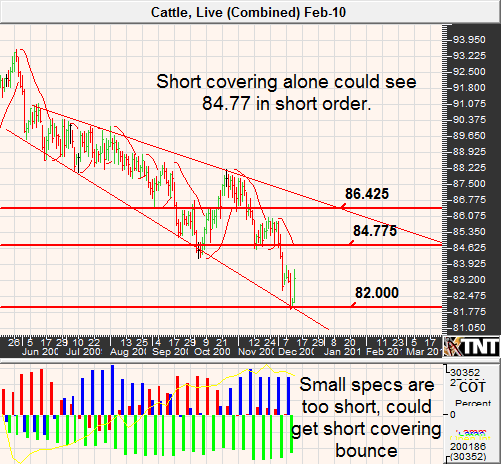 Coffee prices have had a difficult time picking a long-term direction but the choppy action has been slightly bullish. The stocks to use ratio is a bit tight at .13 and seasonal consumption of coffee should keep a floor under pricing. 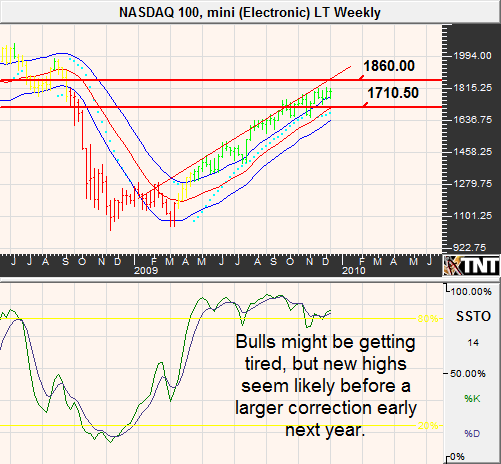 However, the weekly chart looks a little heated, if you want to be a bull we recommend waiting for better pricing. We don't have a strong opinion in coffee either way and will leave this one up to you. However, look for support near 133. Cocoa is trading at historically high prices thanks to concerns over black pod disease and swollen shoot virus in the Ivory Coast and Ghana. However, it seems as though the market has reacted to such news and many times when all of the negative press is out...it is tough for pricing to stay afloat. We aren't bold enough to call an exact high in cocoa, but we feel like one is looming. We think that a rally to 3475ish is probably in the works, but knowing that the seasonal high comes in just before Christmas makes us favor the bear camp. Cocoa is a bit thin when it comes to volume and isn't for the faint of heart when it comes to futures trading (or selling call options), but simply buying out of the money puts might be the answer. Again, we think higher first so if the market rallies to our noted levels and you would like to buy cocoa puts...let us know! Pork production has been on the decline as many ranchers suffered in 2009 at the hands of a lack of demand due to swine flu concerns and other issues. According to the U.S. Meat Export Federation, pork exports in the first 10 months of 2009 were down 14% from a year ago. At one point, hog prices were at such a discount that ranchers were unable to cover their cost of production and were in essence "guaranteed" to lose money. On the other side of the coin, the USDA expects production in 2009 to be down 2% and another 3% in 2010 and this has paved the way for a recovery in hog pricing. 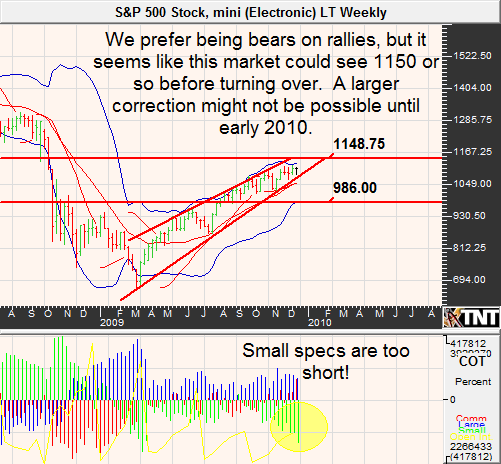 We have been off the mark when it comes to this market but can't help but be temporarily bearish. 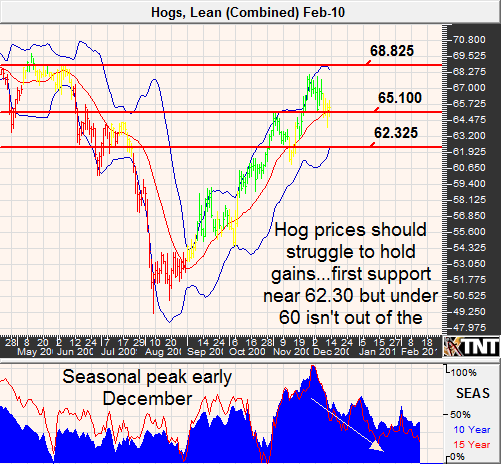 Strong seasonal tendencies for weaker prices and what appears to be an overheated rally leaves us looking lower. That said, 65.10 is pivotal and could spark another round of buying. We like looking for bearish opportunities well into the 68 cent area. A lack of demand for beef has left cattle prices far more vulnerable than we had originally anticipated. Last month we were looking for support near 84 cents to hold but we now know that the selling began there rather than ended there. On December 10th, the USDA announced that they believed beef production would be down 3% in 2009 but downward revisions in export estimates weighed on the market. We are going to stubbornly look for better prices in cattle. Friday's rally, albeit short covering, might have been the start of something much larger. Look for a move to 84.77ish but a break at this level could lead to the mid-86 price range.